By far, the most fascinating, challenging and fulfilling animals I have had the pleasure to keep have been cephalopods. The boneless and jointless arms, the all-seeing eyes, the color and texture changing abilities, the jet propulsion locomotion, the misdirection of inking to confuse predators, the ‘live fast and die young’ lifecycle, and the fierce ability to stalk and capture prey make me feel like I am watching aliens from another world. Wunderpus photogenicus, living up to its Latin name in full! For the past four years, I have bred and kept dwarf cuttlefish Sepia bandensis, incredible animals in their own right, but they pale in comparison to my most recent cephalopod adventure – the Wunderpus, Wunderpus photogenicus. 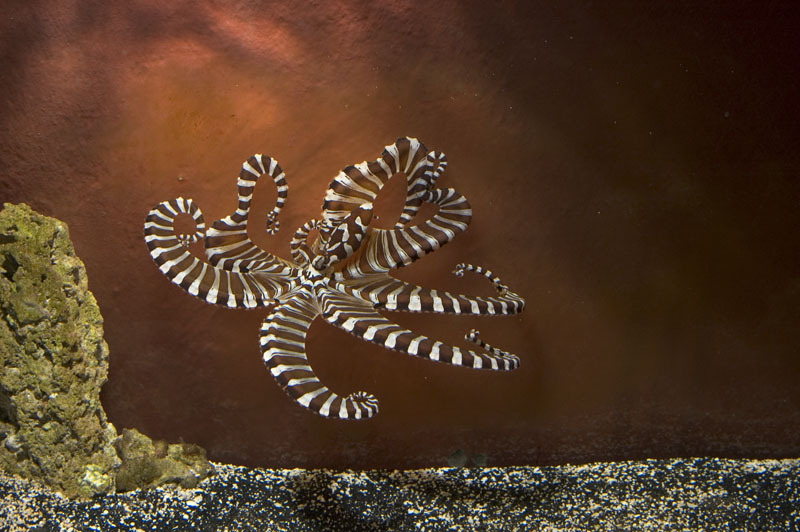 The Wunderpus, often confused with the Mimic Octopus (Thaumoctopus mimicus), has only recently been described by science, and very little is known about its habits and lifestyle. Wunderpus are found primarily in Indo-Malayan archipelago ‘muck’ habitats; vast, rolling underwater plains of settled silt an mud populated by an unexpectedly large amount of unique animals like the Pegasus Sea Moth, the Ghost Pipefish and a plethora of nudibranchs. Fitting right in with its odd neighbors, the Wunderpus is a master of camouflage blending into its surroundings with ability that puts chameleons to shame. Digging itself a den in the muck, and emerging at dawn and dusk to hunt small shrimp and fish, the Wunderpus’ spectacular defensive and hunting displays may be mimicry of other poisonous animals like lionfish and sea snakes, or perhaps the displays are a declaration to would be attackers that the Wunderpus is poisonous and should be avoided. The fantastic displays and supposed ability to mimic the behavior of other animals have generated much attention in the media, and made the Wunderpus a favorite of photographers – which is reflected in its species name, Wunderpus photogenicus. Some local collectors caught on to the inherent beauty of this animal, and began exporting them for the aquarium trade (at retail prices exceeding $400 an animal) before science has had time to catch up. So much so that several of the specimens used to describe the animal were obtained from aquarium stores. In general, keeping cephalopods isn’t a project to be entered into lightly. They require the stable and clean water quality of a reef tank. They don’t live well with other marine animals, either eating them or being eaten by them. 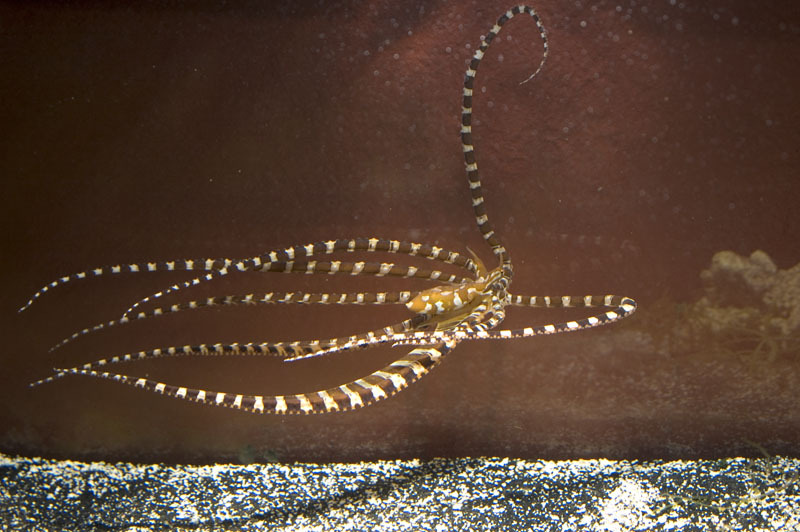 Octopus are escape artists, and if the tank isn’t properly ‘octo-proofed’ the aquarist will most likely wake up one morning to find an empty aquarium, perhaps finding the dried out husk of the animal in another room a day later. Cephalopods not only eat voraciously, but they often only accept live foods, making them startlingly expensive animals to keep. Obtaining an animal can be difficult because there are notoriously terrible shippers, often arriving at their destination dead in a bag of ink filled water. But the biggest downside to keeping a cephalopod is their short lifespan. 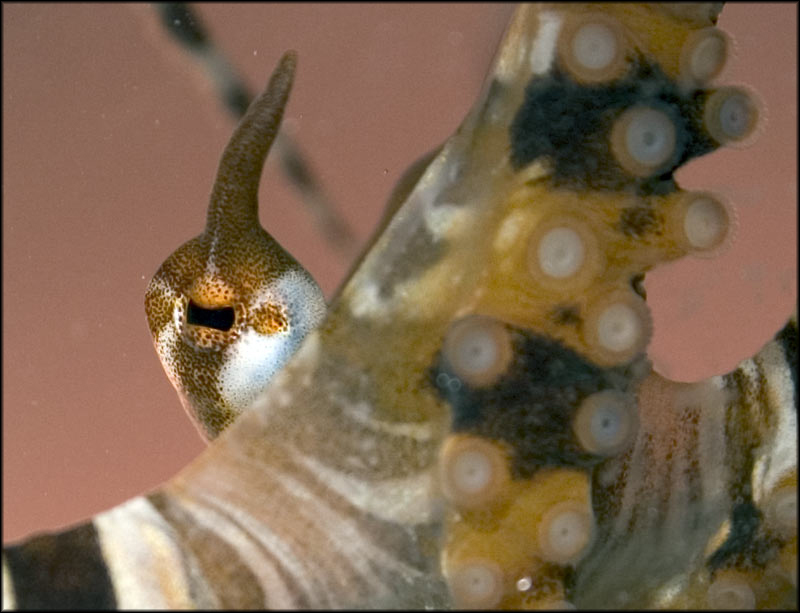 Many warm water cephalopods live less than a year naturally, and since most in the trade are wild-caught adults, their lifespan in the home aquarium may be as short as a few weeks. So far, Wunderpus have done dismally in captivity, generally living only a few days or weeks in aquaria. 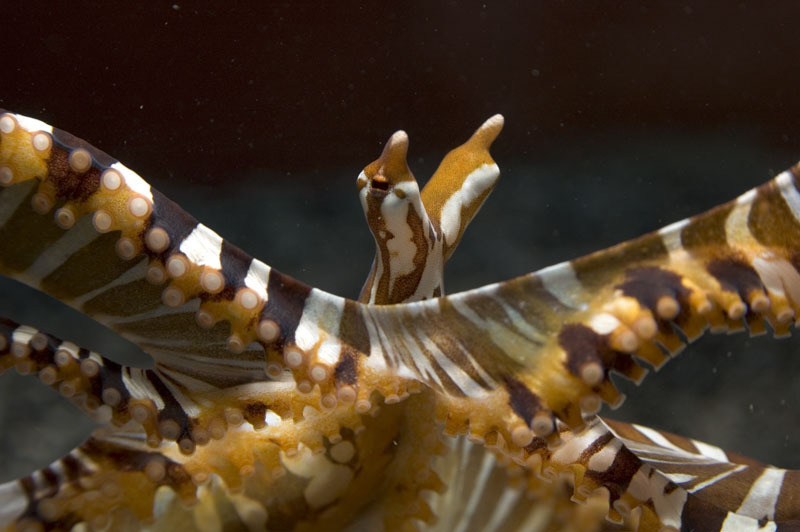 It is unclear if the species is more fragile than other cephalopods; if the people buying them are more interested in having the newest animal than in proper husbandry; or if the chain of custody in the aquarium industry makes it difficult to obtain a healthy, undamaged specimen. Even knowing about all the potential pitfalls of cephalopod husbandry, keeping a Wunderpus warrants special consideration. Many cephalopod enthusiasts feel that the Wunderpus shouldn’t even be collected for the trade at least until more scientific research has been done on the species. The size of Wunderpus populations in the wild is unknown, and it is unclear what effect their collection will have on those populations. If little is known about what they need to survive in the wild, even less is known about what they need to live well in an aquarium. After much wrestling with this issue, I urge even experienced cephalopod keepers to think long and hard before bringing one into the home aquarium. I accepted responsibility for Fontanelle because, by serendipity, I was able to obtain a healthy animal before it was tanked at an importer at a time when I had a mature, cephalopod-ready aquarium available. Every morning as I went downstairs to my cephalopod room I expected to find my specimen, a male named Fontanelle, dead. Amazingly, I was able to keep Fontanelle alive for just over 10 months and I attribute this success to having a Wunderpus ready aquarium cycled and ready to go when the octopus became available. If I had had to throw a system together for this animal, I am sure it would not have lived nearly as long. My cephalopod system has taken over an entire room in my house. 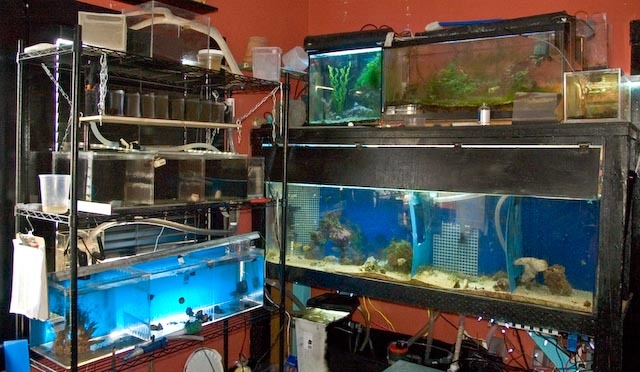 It totals roughly 300 gallons of various sized aquariums, cubes and water tables plumbed into a central sump located under the house. There is a 1000 watt heater, at ½ HP chiller, a remote deep sandbed, a large needle wheel skimmer, live rock spread thorough the various tanks, and a macro algae growing chamber to help export nutrients. The water quality levels are maintained at the basic values needed for reef tanks, although the Nitrate is generally higher than I would like; pH 8.0-8.4, 78 degrees F, Ammonia 0, Nitrite 0, Nitrate 20-40, and salinity 34ppt. Since corals are not kept in this system, I rarely check Calcium, Alkalinity or Magnesium, but all water for water changes come from my reef system so I suspect those levels are well within reef keeping range. I cover all overflows with filter foam glued or zip tied in place to prevent an octopus from going on walkabout in the plumbing. I prevent octopus escape from the top of the tank by gluing a piece of acrylic to the top of the tank, with holes drilled for any needed wires or plumbing, then I use 2 part epoxy to seal any gaps. The remaining open portion of the top of the tank is then be fitted with a piece of acrylic fitted with an acrylic flange that overlaps the piece that is glued to the top of the tank. The ‘lid’ is then screwed or weighted in place. . I usually cut a hole and glue a plastic jar mouth and screw on lid in place to make getting food into the tank easier and less stressful to the octopus. If you are interested in keeping any kind of cephalopod, please do your research before your purchase. I highly recommend the online resource www.TONMO.com (the place on the net for all things cephalopod) and the book Cephalopods: Octopuses and Cuttlefish for the Home Aquariumby Nancy King and Colin Dunlop. My first priority with Fontanelle was keeping him alive; I kept him under constant, worried, surveillance for the first week, but I did nothing to disturb him. He ate, explored his new home in the mornings and evenings, and spent the rest of the time in his den behind the intake of the hang-on-back overflow on the aquarium. Sometimes in the middle of the night (yes, I do check on animals in the middle of the night) or early in the morning, I caught him burrowing into the substrate, something that it seems no one has seen before in captivity. Fontanelle had been doing well for several weeks, so, hoping to simulate the ‘muck’ of his natural environment, I decided to plumb another tank into the system to provide him a variety of mud and sand substrates. I did everything I could think of to make the transition to the new aquarium as stress free as possible. The new tank used the same lighting, similar flow, an identical external overflow, some rocks from the old tank, and had similar positioning in the room. I was able to easily coax Fontanelle into a plastic bowl, transferring him into his new home in less than a minute. He has made several attempts at digging in the mud substrate, but, just as in the old tank, has made his den behind the intake to the external overflow. As he settled into his new home, I witnessed new displays. The extra space allowed him to swim across the tank, body thinned out with two arms probing forward and 6 arms trailing behind. Appearing to claim his territory he swirled, arms curled about him, extending his arm membranes to appear huge and fierce. 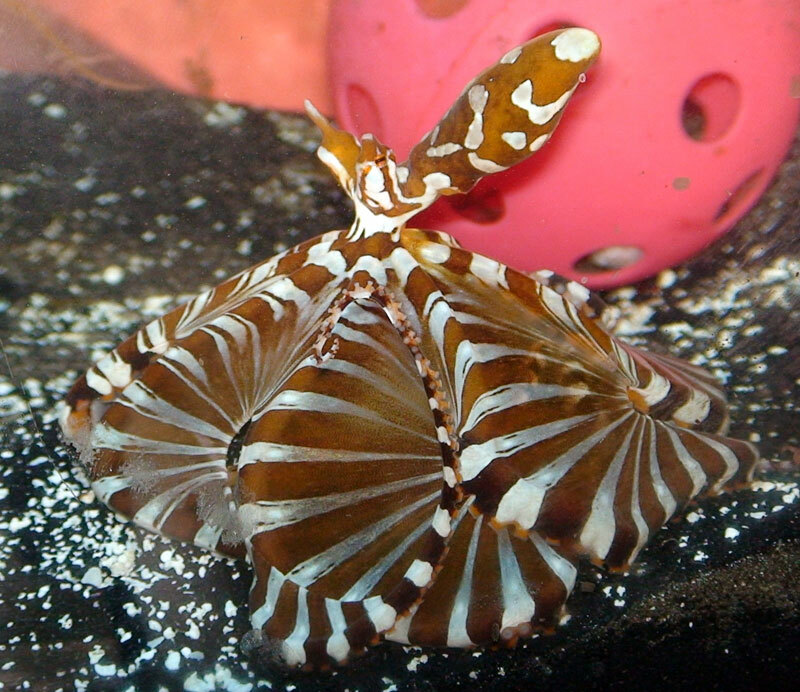 While hunting a small shrimp, he pounces from above shaping his arms and membranes into an umbrella to trap his prey against the substrate. Wunderpus often use the webbing between their arms as living ‘cast net’ to capture prey. Unfortunately, this behavior seems short lived in captivity. 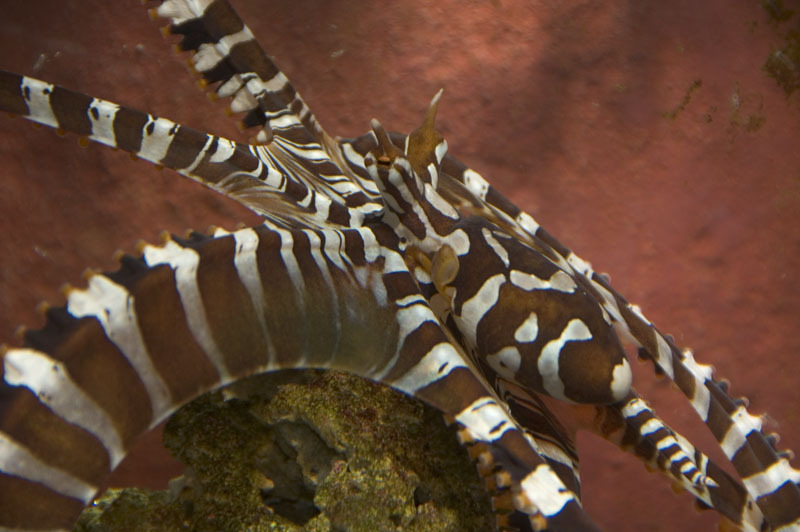 Personally, my favorite display is when lines of color pulse up his two eyestalks like the electrical arcing of a Jacobs Ladder – I’m not quite sure what that means in octopus, but it sure is impressive. The bittersweet consequence of Fontanelle’s acclimation is that the more impressive displays appear less and less, which seems a fair trade for his continued survival. So far, breeding Wunderpus in captivity has been utterly unsuccessful – which makes sense given how little we actually know about these animals. In the few cases where eggs have been hatched in aquaria, the planktonic paralarvae did not accept any foods and all died within 5 days. Hopefully in the near future, the life-cycle of the Wunderpus can be closed and captive breeding of these animals will become a reality, making tank-acclimated specimens available to aquarists, and without collectors having to take specimens from wild populations. The Wunderpus is an amazing animal in all respects and I feel honored that I have been able to keep Fontanelle alive and healthy for so long. I am thrilled at my current success, but due to all the unknowns regarding wild populations, I am hesitant to try to obtain any more Wunderpus even possibly for an attempt to breed them. In the future, I hope this species become available as captive bred specimens while the wild populations thrive.